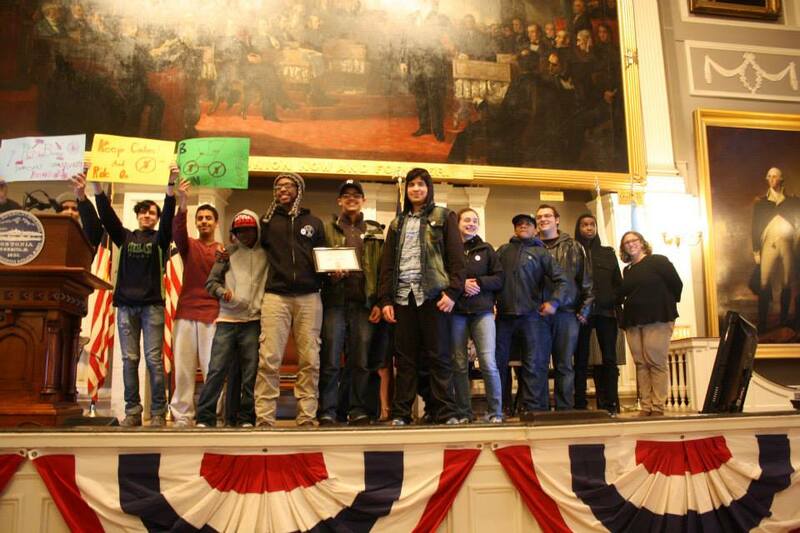 Last night at the Boston Bike Update Bikes Not Bombs received the ‘Organization of the Year’ Award. I’m proud to work at an organization that gets recognized as ‘working on issues of inclusion before equity was the buzzword of the bike movement.’ Bikes Not Bombs has been working on issues of equity and biking in Boston for 30 years, and is still going strong. We got the only standing ovation of the night when we went on stage to accept the award. It would have been even cooler if Boston Bikes, after spending much of the presentation focusing on how important equity is, had been able to really answer two well phrased questions about how Boston Bikes is concretely working to further issues of equity and biking in Boston. Instead they really side stepped the questions. That was disappointing. But otherwise it was an interesting night – and my first experience seeing the bike advocacy scene in Boston.